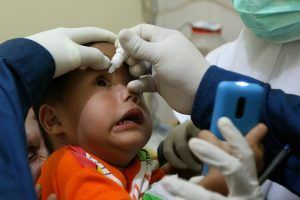 Our core team on the ground are a group of dedicated volunteers who, with their different professional skills, carry out the vital medical and other work required in the lead up to, at, and following, Eye Clinics. From doctors to nurses to patient care, equipment and supply co-ordination to photography and communications. Each and every Core Team member has been selected to carry out a vital task that contributes to the web of functions necessary to achieve our purpose. Anna is an Indonesian who has been living in Australia for the past 2 decades. Aside from running a busy business (Sushi Sushi Australia), Anna is actively involved in our activities, advocating A New Vision’s work to overseas Indonesians and is often present at the eye camp with her children, Brendan and Claudia. Her energy and enthusiasm are infectious. Anna’s dream is to see A New Vision’s eye centre, operating on every single day of the year, round the clock, restoring sights to everyone who needs. is a young, talented, focused and dedicated eye surgeon with a heart of gold. A vegan, whose hobby is to read publications on ophthalmology, Dr Teguh seeks every opportunity to learn and grow. Dr Teguh, despite his youth, is fast becoming one of the best cataract surgeons in Indonesia. 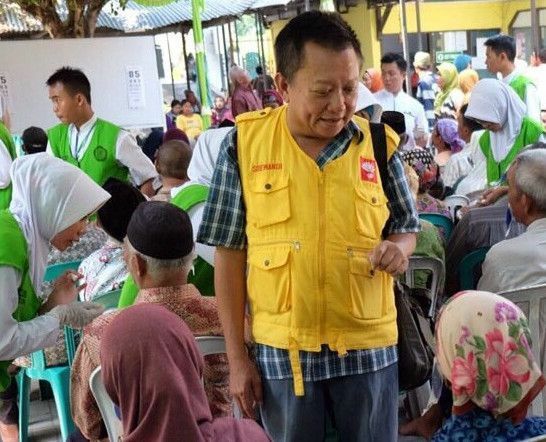 Such is his dedication to serve the poor, Dr Teguh declined numerous offers to join prestigious commercial eye centres in order to allow ample time for his philanthropic work as a surgeon at Eye Clinics. 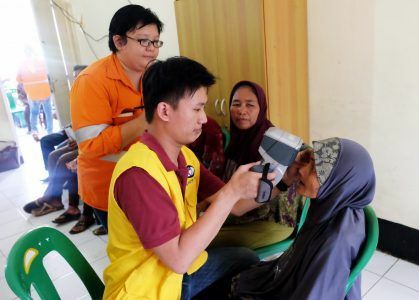 He also works two days a week out of RS Fathma Medika, a private hospital in Gresik, East Java, servicing poor patients, a project funded by A New Vision. He never complains of the two hour drive each way from Surabaya to Gresik! Gilang is a young paramedic who not only rises to meet the exacting standards Dr Teguh expects of his medical staff, but revels in the opportunity to push himself to perform at his optimum. Gilang recognises the sheer devastation one mistake could make in the life of a patient and takes his job very seriously. In his downtime, Gilang loves to unwind with hard rock music. 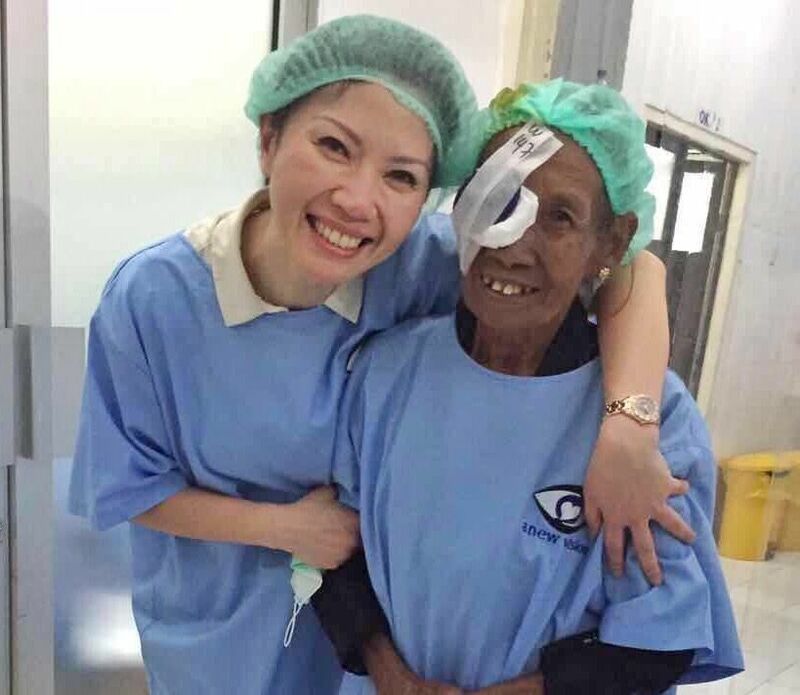 known as Dr Wulan is, without a doubt, the most prolific cataract surgeon in Indonesia. Practising in the West Nusa Tenggara province which comprises a group of islands inhabited by over 4.5 million people, this province is one of Indonesia’s poorest. Impacted by malnutrition and its subsequent outcomes including high rates of infant mortality and a lower than average life expectancy, the region is also affected disproportionately by cataract blindness. 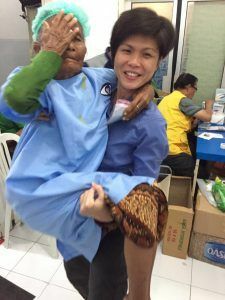 Of the 3000 cataract surgeries performed annually in West Nusa Tenggara the petite sized Dr Wulan carried out 80% of these. Her surgical skills are known to rival any great surgeon in the world. 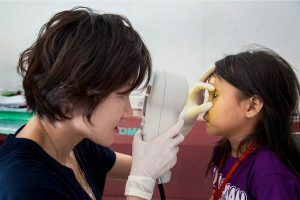 And she chooses to remain in this rural province where she is passionately committed to eradicating blindness in an area with such great need. has been assisting Dr. Wulan for many years. Quiet, reserved and conscientious, she takes her job seriously and cares a lot about her diabetic father. 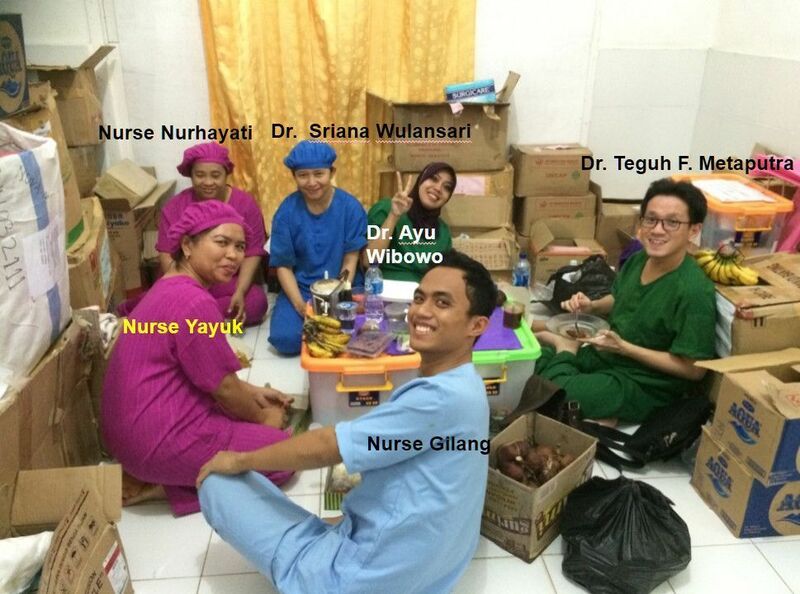 originally from Bali, Yayuk has been living in Lombok for many years assisting Dr. Wulan. She carries with her the typically Bali friendliness and jovial attitude. 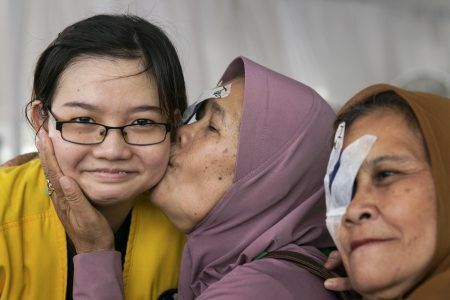 While most Jakarta based eye surgeons opt to use the more expensive phacoemulsification technique (most suitable for immature cataracts and financially able patients), Dr Ayu Wibowo wants to prevent the deterioration of her Manual Small Incision Cataract Surgery (MSICS) skills – the technique used in low cost and free Eye Clinics, revolutionised by Dr Ruit of Nepal. She finds doing surgery at charity camps to be an incredibly rewarding experience. is practising in 3 hospitals on a full time basis, rather than spending his weekend resting, he will jump at the first opportunity to join surgery events with us. 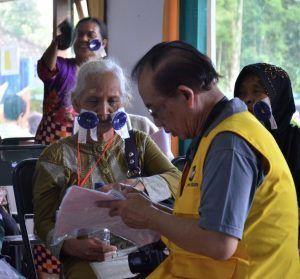 Is an army eye doctor who has been with A New Vision since the inception of our work in Indonesia. 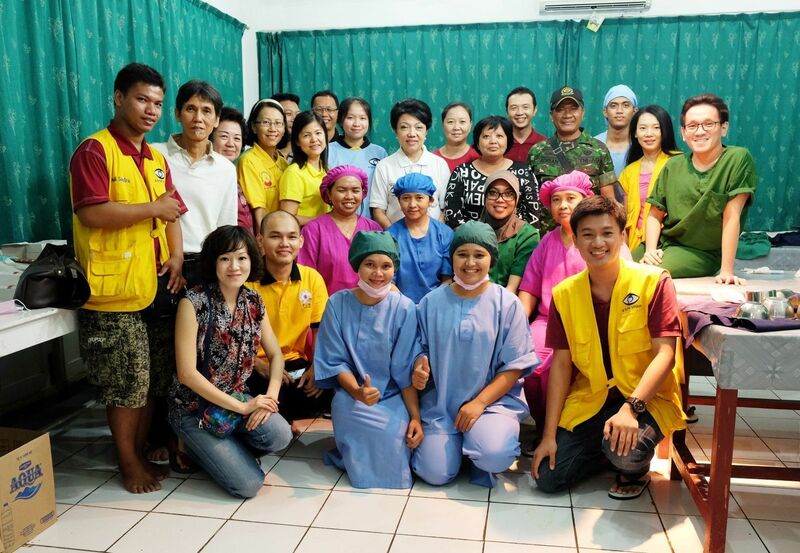 His role in advocating the professionalism and humanitarianism of Dr Ruit to the Indonesian Government and fellow eye doctors was pivotal in opening doors to allow A New Vision to successfully set up their first clinics. 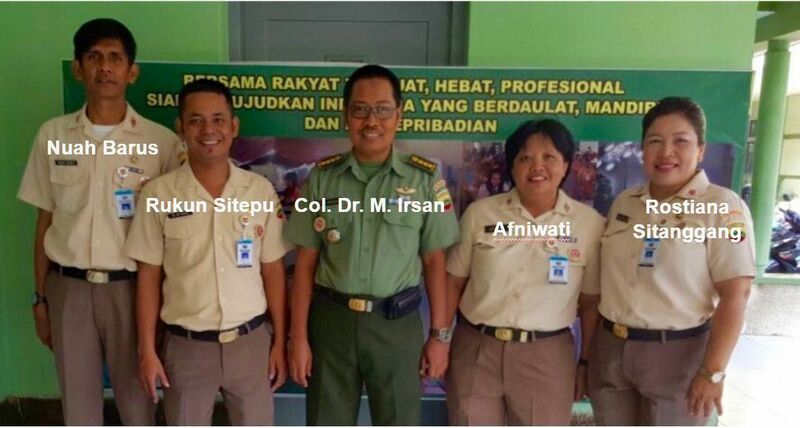 Colonel Irsan became Indonesia’s first doctor to be trained by Dr Ruit. 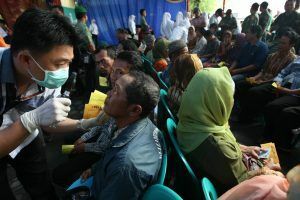 Because of his reputation as one of the country’s best cataract surgeons, Col. Irsan was one of two surgeons selected to accompany Indonesia President Jokowi on a January 2016 goodwill trip to East Timor, where he performed cataract surgery on East Timorese. Col. Irsan honourably seeks to find solutions for all patients, including those for whom it is found cataract surgery is not appropriate. His compassion for his patients is visible always. In his free time, the easy going Col. Irsan loves cycling. were the first two paramedics from Indonesia who went together with Dr. Irsan to Tilganga for training and they have always been by Dr. Irsan’s side, assisting in his every surgery. Rukun is a jovial guy who loves singing and has many passing hobbies, from planting flowers to collecting precious stones. Nuah is the strong man in the operating theatre, from pacifying terrified patients to lifting frail old one onto and off the operating bed. We can breathe a sigh of relief when Afniwati is in charge of sterilisation. Her positive attitude and warm personality makes her a joy to work with. Always able to crack a joke and bring laughter even in challenging situation, e.g.. when our car broke down at 1am, in the middle of nowhere, half way through our 15 hours drive home. Or when she finally heard her phone ringing at midnight which was Dr. Irsan’s 27th call attempt asking her to take the 6am flight that day to Sidempuan, to urgently assist in our surgical camp. Every patient loves Rostiana because she has the natural ability to break the ice and make people feel relaxed. Regardless of whether there are 10 patients or 100 patients waiting in the line, Rostiana gives each of them equal attention. When we asked a common friend what Soewandi was like, we were told he is a social activist and that we couldn’t have found a better partner for East Java. Not only did Soewandi link us to Nahdatul Ulama, the largest moderate Islamic association in Indonesia (40 million members), he has also been heavily involved in all of our East Java cataract surgical activities since 2013, looking for hospitals, meeting local authorities, gathering volunteers, distributing cataract flyers at markets. As if that is not enough, he is now helping us to look for site for our first community eye center. No pressure, we want land accessible by all means of public transport, in flood free area, big and cheap. A calm, soft-spoken but firm, Soewandi is a man who talks the talk and walks the walk. Elwi has been with us from our very first cataract surgical camp in Dec 2010. Back then, apart from Dr. Ruit, none of us knew anything about organizing cataract surgical camp. Now, the only tasks Elwi can’t do at the camp are anaesthesia and surgery. Elwi has a great sense of humor and she drinks water like hippopotamus. These two are essential qualities for the camp, to make sure everyone remains sane and no one is dehydrated. Elwi is the cousin of our founder, Effi. Many people often get these two mixed up even though they have two distinct different hairstyles. Superbly capable and reliable, Emily joined our core team in 2013 after hearing stories about our work from her friend Theresia Sembiring. Because of her capability, Emily is often given one of the hardest tasks, to manage the several hundred people crowd at registration desk. This is not a task for the faint hearted. Emily is a wonderful volunteer who has no hesitation to do a task nobody likes, ie. data entry. Days after the camp was over, Emily would be sitting in her home, shifting through hundreds of patient records and entering them on excel. What more can we ask for? Emily is a dog lover who is housing two rescued dogs. She is also pretty good at muay thai, if the dogs ever fail to protect her. Meet our five-star volunteer, Siew Yian. She is an all-rounded, energetic and affable woman with a heart of gold. She came from Singapore to volunteer at A New Vision’s outreaches in rural parts of Indonesia. She is amicable and gets along well with everyone, including patients who don’t speak her language. Her sincerity and compassion were shown even in the littlest thing she does, such as distributing snacks to kids who were waiting for their relatives outside the surgery area until late at night, buying sandals for patients who came barefoot. She is a ball of energy and never complaints that she is tired. Even when the surgeries lasted until late nights, she continued to be around, helping in the surgery rooms, interacting with patients, and motivating her fellow volunteers. Her contributions towards A New Vision goes beyond volunteering during the surgical event. She speaks for us and raises funds by sharing stories on her Facebook friends about our patients, our work and our mission. Here is Theresia, our prolific volunteer recruiter! A bright young lady with a big smile, conscientious and dependable. 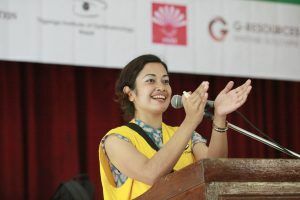 Theresia has a Bachelor of Industrial and System Engineering Degree from the National University of Singapore, she left her corporate job in Singapore to return to Indonesia to do community work, and soon after she joined A New Vision. Always hungry for knowledge, she applied for and was granted Chevening scholarship to pursue a Master of Arts in Development Studies at University of Sussex, UK. Not a surprise, this young lady has had scholarship after scholarship since primary school. So passionate was her about A New Vision’s work that during her interview for Chevening scholarship, she could not stop talking about what we do until one interviewer had to pause her. A fellow animal lover, Theresia has two cute rescued puppies and a young curious cat. Alice is a down to earth lady who does not believe in organizational boundaries when it comes to helping people. She has been doing charity work for decades, she is also the head of health services for Tzu Chi Buddhist Foundation North Sumatra chapter and has her own Drs. Kofie Charity Foundation. A New Vision has benefitted a lot from Alice’s helping hand especially in North Sumatra. When one is with Alice, one would quickly notice that her phone hardly stops ringing and it is always about someone somewhere who is poor and sick and needs help. A Buddhist believing in reincarnation, Alice always said she would like to be re-born to a similar life as she now has, in which she can continue to help others. Dr. David is a secondary school friend of Theresia Sembiring. Dr David has always loved serving marginalized community. Since becoming a doctor, he has been working in remote community, from central Kalimantan to Sumbawa island. Dr. David was considering specialization in neurology, because he wanted to do charity surgery for people with brain damage. After volunteering to screen patients for eye diseases at our camps, seeing the gravity of blindness and the almost instantaneous cure, Dr. David is now keen to pursue ophthalmology. We hope he can start studying at Tilganga under the tutelage of Dr. Ruit soon! 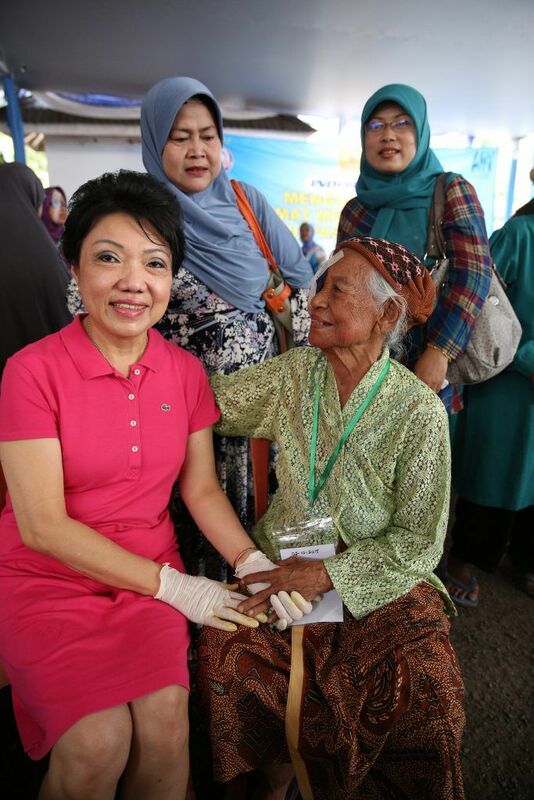 Age is not a barrier, at 76, Dr. Haryoko enjoys every single moment volunteering at surgical camp. He is usually in charged of our storeroom for dispensation of lenses and medicines. A thorough and cautious man, he makes sure he triple checks the power of the lens stated on the packaging against the patient’s form, before giving. But when the going gets tough, Dr. Haryoko is ready to leave the comfortable chair in the storeroom and gets on the road. He personally went to 5 districts in Nias island over 3 nights, just him and the driver, screening patients for eye diseases. Dodi is a young hard-working man and has been part of A New Vision core team since our first camp in Tapanuli region in 2011. Dodi works as an office boy and he takes leave of absence whenever we have camps in Tapanuli to volunteer. Caring and attentive, Dodi would volunteer to sleep at the hospital barrack, in case patients needed help in the middle of the night. His family and friends are also part of our team, by regularly bringing patients from their local community to the camp. Lee Siew Yian, Alland Dharmawan, Afriadi Hikmal, Binsar Bakkara, Michael Amandolia, Debby Ng.